The Microsoft Zune Is Officially Dead – Long Live The Zunetanic! We recently announced that, going forward, Windows Phone will be the focus of our mobile music and video strategy, and that we will no longer be producing Zune players. So what does this mean for our current Zune users? Absolutely nothing. Your device will continue to work with Zune services just as it does today. And we will continue to honor the warranties of all devices for both current owners and those who buy our very last devices. Customer service has been, and will remain a top priority for us. Was the Zune dead on arrival? When it was introduced back in 2006, it was missing some key features, like attractive styling, podcast support and a sensible way to buy content. It was called the biggest flop of 2007 and a dismal failure, among other things. And that’s not mentioning the whole squirting thing. Or the Zunepocolypse. Microsoft did keep iterating the Zune – adding things like advanced podcast support – but it never made much of an impression with buyers because the company always tried to imitate the iPod, an established competitor with better hardware selection, more content, a broader ecosystem of peripherals and cross-platform support. Microsoft put all their marketing efforts into introducing a product that was clearly imitative and clearly inferior, effectively establishing the Zune brand as a poor substitute for the iPod. Technology from later Zune incarnations may live on in the Windows phone and in upcoming Windows OS’s. 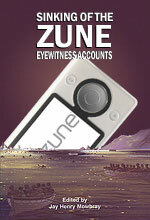 But it appears that, wisely, Microsoft is leaving the Zune brand behind. What do you think of the Zune’s inglorious demise? And what do you think Microsoft should have done differently? It always cracks me up to hear Zune apologists try to blame the Zune’s failure on Apple brainwashing people, when the original Zune was such a complete turd that Microsoft dumped into the market. And they marketed the hell out of the Zune. That or they’d say that the Zune has better features. No – the Zune had a built-in radio tuner, which nobody who buys a portable media player really cares about, because you buy a portable media player to avoid the crap they play on the radio. Microsoft should have been building something like the iPad or the Kindle, instead of trying to imitate Apple. It’s a good thing that Microsoft has corporate America purchasing to coast on. Keep in mind that Zune Music, Video and Podcasts does live on as a software service to Windows Phone, Xbox and Windows 7. The Zune devices was only part of the picture. The full Zune Podcast Marketplace is now integrated into Windows Phone 7.5 Mango and supports on phone subscriptions and over the air episode downloads and streaming direct to all Windows Phones.